Brain activity can be measured non-invasively with functional imaging techniques. Each pixel in such an image represents a neural mass of about 105 to 107 neurons. Mean field models (MFMs) approximate their activity by averaging out neural variability while retaining salient underlying features, like neurotransmitter kinetics. However, MFMs incorporating the regional variability, realistic geometry and connectivity of cortex have so far appeared intractable. This lack of biological realism has led to a focus on gross temporal features of the EEG. 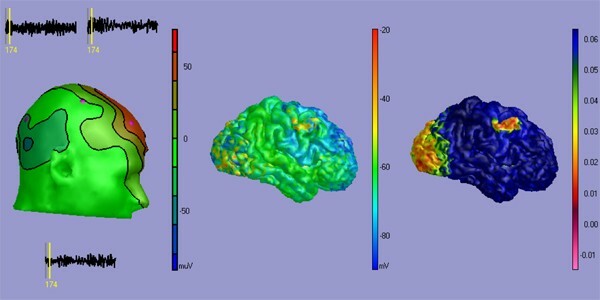 We address these impediments and showcase a "proof of principle" forward prediction of co-registered EEG/fMRI for a full-size human cortex in a realistic head model with anatomical connectivity, see figure 1. MFM prediction of simultaneous EEG and fMRI with local, contralateral and visual connectivity. Left: EEG scalp potentials. Middle: MFM excitatory soma membrane potential he. Right: fMRI BOLD response. MFMs usually assume homogeneous neural masses, isotropic long-range connectivity and simplistic signal expression to allow rapid computation with partial differential equations. But these approximations are insufficient in particular for the high spatial resolution obtained with fMRI, since different cortical areas vary in their architectonic and dynamical properties, have complex connectivity, and can contribute non-trivially to the measured signal. Our code instead supports the local variation of model parameters and freely chosen connectivity for many thousand triangulation nodes spanning a cortical surface extracted from structural MRI. This allows the introduction of realistic anatomical and physiological parameters for cortical areas and their connectivity, including both intra- and inter-area connections. Proper cortical folding and conduction through a realistic head model is then added to obtain accurate signal expression for a comparison to experimental data. To showcase the synergy of these computational developments, we predict simultaneously EEG and fMRI BOLD responses by adding an established model for neurovascular coupling and convolving "Balloon-Windkessel" hemodynamics. We also incorporate regional connectivity extracted from the CoCoMac database . Importantly, these extensions can be easily adapted according to future insights and data. Furthermore, while our own simulation is based on one specific MFM , the computational framework is general and can be applied to models favored by the user. Finally, we provide a brief outlook on improving the integration of multi-modal imaging data through iterative fits of a single underlying MFM in this realistic simulation framework.